The real problem with Christmas is not that some people say "Holiday" instead, but that it has become so commercialized. So for 12 days I will show an example each day of the "Christian" trinkets you can waste your money on. 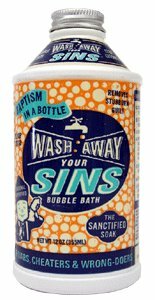 On the 2nd day of Christmas you could show who is your "true love" by buying "Wash Away Your Sins Bubble Bath." It costs $11.95 for a 12 oz bottle. Thanks to blogs4God for pointing this item out. I'm also going to list about 8 other items of Jesus Junk - feel free to "shop around" for items you want to use for the next 10 days or so. Thanks in return for your linkage. It is another good (but sad) list of "Jesus Junk." I daily check out blogs4God, and would encourage others to do so as well. Keep up the good work!